Welcome to Florence’s best kept secret. 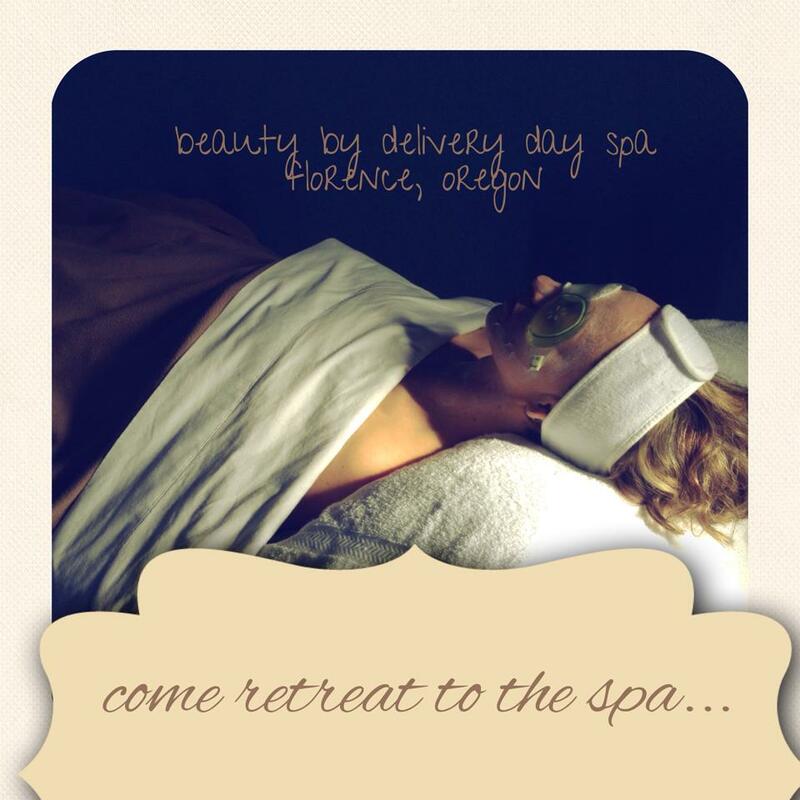 Enjoy our award winning day spa on the Oregon coast. We offer organic and natural products from Farmhouse Fresh. We offer seasonal treatments that will make your skin soft and happy. Anti Aging Treatments, Acne Treatments, High Frequency Treatments. LED Light Therapy. Natural Nails, Gel polish Manicures, Luxury Hot Stone Organic Pedicures. Organic Manicure: All the basics plus polish $25. Organic Gentleman’s Manicure: All the basics and a polish free buff. $30. Spa Manicure: Spa Manicure is our gel polish manicure. Try the new two week manicure. Oil and lotion. Starts at $35. Organic Ultimate Manicure: This manicure is the whole deal; enjoy our pretty and hydration manicure as well as hot towels, massage, mask, scrubs, oils and gel polish. Starts at $50. Organic Spa Pedicure: Enjoy all the pedicure basics including a mask. All organic products, seasonally scented. Includes beverages of your choice, polish. Starts at $45. Gentleman’s Organic Pedicure: Enjoy all of the perks of our Organic Spa Pedicure….and this pedicure is tailored to men. Enjoy the fantastic line of organic spa products, in combination with a buff on the toenails at the end. $50. Organic Hot Stone Pedi: Enjoy the ultimate in relaxation!! Stones in your pedi bath, scrub, mask, cuticles and nails trimmed, paraffin, massage and hand massage. Over one hour service, includes gel polish or regular. Enjoy our line of 100% Organic pedicure products. Hot stone massage on legs and feet. Starts at $60. French manicure in ANY of our 90+ colors $5. Skin Consultation: This appointment in ON US! Lets sit down and take a look at your skin concerns, and what we can do to address them. Our skin care specialist can tailor your skin care needs during the one on one consult. We will also send you with samples. No Charge. Allergy Facials: 20 minute service made to help lessen the discomfort associated with allergy symptoms. Facial includes our aromatherapy treatment and facial massage, steam. Helps decongest and open up airways. $25. Relaxing Facial: This facial is designed for relaxation. Its the perfect introduction to facials! Combining all our gadgets we use to make your skin super soft, resilient, hydrated and most importantly radiant. We use the best in facial technology, and always have the correct product to fit your skins individual needs. We also offer many extras for your hands, arms. Aromatherapy is also offered with this service. $49. Acne Facial: This skin type and condition affects teens, and adults alike. Our gentle line of botanical products drive this facial. Facial includes, deep clean with Clarisonic Skin Care System, through extractions, mud based clarifying mask, followed up by toner. High concentrate of professional acne serums, to help with the many stages of acne. LED or High Frequency is part of this facial. $57. Anti Aging Facial: Our anti aging facial will leave tired, dull, sluggish skin feeling refreshed. This facial promotes oxygen revitalizing properties which are lost as you age. Using our oxygen friendly line of cleansers, exfoliators, masks, toners, vitamin enriched serum we can attempt to stay ahead of the effects of aging. Aromatherapy is also offered with this service. $69. High Frequency Treatments: The high frequency aesthetic machine’s main function is to produce heat in targeted skin tissues. This heat, through different processes which will be further discussed later, does wonders to rid the skin of acne, reduce appearance of wrinkles, eliminate cellulite, fade dark circles around the eyes, improve hair growth through improving blood flow at the scalp, reduce puffiness around eyes (“puffy eyes”) and trigger a long term general improvement in skin’s overall health. Add on to facial: $10 or a solo treatment for $40. LED Light Treatment: LED Light Therapy is a pain-free, non-invasive, soothing and rejuvenating skin treatment. This treatment will help treat acne breakouts, fine lines and wrinkles, post inflammatory scarring and rosacea. It will not only help decrease acne, but also soothe your skin and reduce both redness and inflammation. Solo: $45. Upgrade during a microderm or facial: $10. Microdermabrasion: We offer the LATEST in Microdermabrasion technology. Our machine is high end and uses PURE FLOWER GRAINS to ensure the best results. It has been created with the most sophisticated technology to exfoliate the skin, while provides the skin natural benefits, vitamins, minerals. Recommended every four to six weeks. $79. per session. Facial & Microdermabrasion Combo: Enjoy a full relaxing facial, with the addition of a high tech Microdermabrasion, instead of scrub!!! Get all the perks of relaxation and working on your skin in ONE appointment. All the extras: LED, Aromatherapy. $120. We use a few different waxes….not all hair is created equal, nor is all wax. Your skin care specialist will take great care in making sure you have a safe, clean and effective wax. New Client Eyebrow: Brow shaping is for the client who is NEW to waxing eyebrows or a client who is not maintained over a three week period. We shape brows and get them ready for your eyes to shine! $18. Eyebrow Maintenance: Created for our clients who are on regular regimens for waxing, 3-4 weeks with appointments booked. $13. Full Face: axing Different parts of the face. Full face normally includes three areas or whole face, most cost effective way. $32. Lip & Chin, Lip & Eyebrow $22. Choice of one: Lip, Chin, Toes $13. Brazilian: $65. Rebook 3-5wk: $50. Half Legs: $30. Full Leg: $52. Half Arms: $30. Full Arms: $40. Aromatouch Technique: Bring body back to balance. Helps…. Stress. Emotional fatigue. Mood and overall body function. This product application therapy uses 8 different oils for relaxation, immune support, helps inflammation, and invigorates…. We are certified for this service. We recommend lots of hydration prior to and after appointment. $65. Reflexology Sessions: This session is done in the quiet atmosphere of the day spa. Fully clothed, you will be able to treat the entire body with your hands, feet, ears. Addressing the entire body and nervous system. . . Hot Stones and crystals may be incorporated into the session. $40. Reiki Session: Emanating from India, China and Japan. Safe for those where massage may be contraindicated. Balancing of energies, blockages, and chakra work. Crystals may be incorporated during this healing session. $45. Our anti aging facial will leave tired, dull, sluggish skin feeling refreshed. This facial promotes oxygen revitalizing properties which are lost as you age. Using our oxygen friendly line of cleansers, exfoliators, masks, toners, vitamin enriched serum we can attempt to stay ahead of the effects of aging. Our 90 Minute Massage is designed to relax mind, spirit and physical body. This is perfect for the client who prefers light to medium pressure. Techniques are mostly western based with Swedish influences. $148. Includes beverages of your choice, robe, we recommend you bring comfy socks or slippers. Our Organic Signature Spa Pedicure…. you will be able to indulge in a refreshment, warm up your back…and enjoy our seasonal pedicure. Organic products, enjoy a polished look when finished. Organic Manicure is our back to basics. Soak, trim, and buff nails. Polish is included, is optional. Enjoy our signature seasonal spa products. Upgrade to gel polish if you desire for an additional fee. Our anti aging facial will leave tired, dull, sluggish skin feeling refreshed. This facial promotes oxygen revitalizing properties which are lost as you age. Using our oxygen friendly line of cleansers, exfoliators, masks, toners, vitamin enriched serum we can attempt to stay ahead of the effects of aging. $129. Includes beverages of your choice, robe, we recommend you bring comfy socks or slippers. Our 90 Minute Massage is designed to relax mind, spirit and physical body. This is perfect for the client who prefers light to medium pressure. Techniques are mostly western based with Swedish influences. $124. Includes beverages of your choice, robe, we recommend you bring comfy socks or slippers. We require 24hr notice for all schedule changes. No show appointments and late cancellations will be charged the full amount of services booked. Are you open on Sundays? If so, does your esthetician have availability tomorrow? I would like to book a facial. I clicked to go to your Facebook, but the link didn’t work (so I couldn’t message you there). I will be away from my computer for awhile, but would appreciate if you’d email your reply.